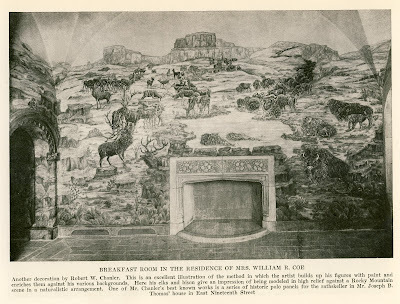 The Buffalo Room painted by Robert W. Chanler in 1920 at 'Planting Fields', the William R. Coe estate designed by Walker & Gillette c. 1919 in Oyster Bay. The Coes spent their summers in Wyoming and I assume had this done to hold them over while they were at this house. Click HERE for more on 'Planting Fields'. Picture from American Homes of To-Day, 1924.
jeez - dilletante - its english - you expected light and airy. they're a gloomy dark people living in a gloomy country. that's why us enlightened english are living here - right? also, it might not be so depressing if it was taken with modern camera tech. love those door lintels. how come zach doesn't have security words? TPR - security words? Like a word verification thing before you comment? You should talk with Wint Aldrich, who is one of Chanler's nephews or grand-nephews. He's fascinated by Chanler too, as am I. Have you see the fantastic fireplace etc he designed and painted for the original Whitney Museum, down in Greenwich Village? Fantastic. Looks like the 1920's version of the "photo-mural"
The most amazing Chanler murals are still extant in Gertrude Vanderbilt Whitney's studio in Old Westbury, still owned by her granddaughter. I was lucky enough to be invited there several times, and could barely focus on the conversation, so entranced was I by his work.Far more exotic than what he did for the Coes, the murals (several cover the four walls of their respective rooms) are breathtaking in their color, originality and exuberance. I particularly remember one bathroom entirely done in gold and black- it was like being inside an Art Nouveau coromandel screen. I would love to find the porcupine screen he painted for Emerald Cunard. I always have fun imagining a peaceful Long Island country house weekend, breakfasting among the buffalo and the bison roaming the walls. Indeed his murals for the Whitney studio are among the very best by anyone in that era. The right combination of patron and artist at work.